The 1990 DCI World Championships were held at Rich Stadium in Orchard Park, New York, a suburb of Buffalo. The Cadets of Bergen County (winning its fifth title in eight years) and Cavaliers and Star of Indiana (each corps achieving its highest placement to date) all outscored the Blue Devils and Phantom Regiment, two corps that were undefeated until late in the season. Madison Scouts' ninth-place show was titled, "Undiscovered Madison." It began with Mark Kirk's "The Lemon Squeeze," discovered by the corps' percussion writer, Chris Thompson. Thompson had formerly taught at Rutgers University, where Kirk was the director of the jazz band. 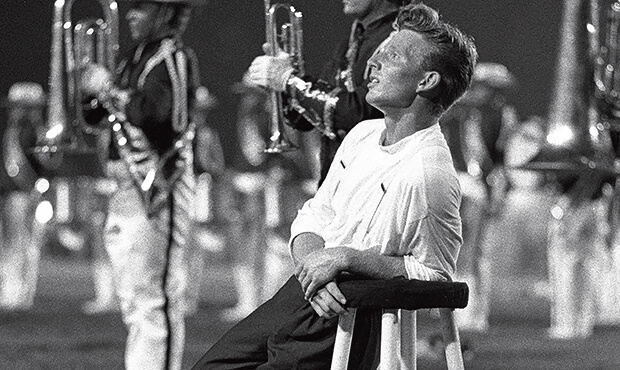 The first minute of "The Lemon Squeeze" was a fairly laidback swing tune, interpreted by the entire color guard section using bar stools as props. The second segment of the work was quick and high energy, leading into a drill form that looked very much like an asymmetrical half segment of a fleur-de-lis. The last part of the song explored swing again, a frenetic section that sounded as if it was intentionally on the verge of exploding out of control, ending with a very brief waltz. The next movement of "Remembrance (Concerto Grosso)" is one of five parts of Paul Hart's jazz-rock fusion suite written in memory of people who were important to Hart. The composer started his music career playing electric bass with England's National Youth Jazz Orchestra in the early 1970s and since has played keyboards and violin with a variety of jazz artists. He has written numerous advertising jingles and scored background music for a number of British television programs, but he's also written works for the likes of classical guitarist John Williams, various wind ensembles and orchestras. The piece started with an unaccompanied baritone solo, followed by a mellow percussion mallet feature. As the brass section came in playing long chords, it slowly built over an extremely long period of a continuous crescendo. Color guard members utilized curved flat devices that looked somewhat like double scimitars. The piece continued to build intensity, backed off, then exploded into a hard driving, screaming epilogue that suddenly ended in a company front that moved forward on a diagonal. The corps' closer of "I Can Cook, Too" came from the Broadway musical, "On the Town," an extension of the ballet, "Fancy Free," written by Jerome Robbins with music by Leonard Bernstein. Both the ballet and musical premiered in 1944, and the musical later became a movie in 1949, starring Gene Kelly, Frank Sinatra, and Ann Miller. Not as well known as the musical's most famous song, "New York, New York," the lyrics to "I Can Cook, Too" were written by Bernstein, while most of the other lyrics in the musical were written by the famed duo of Betty Comden and Adolph Green. The Madison Scouts' arrangement of the music was quite playful, reminiscent of the casual opening swing mood of the opener. Suddenly, the horns cut loose and a rollicking good time ensued. Color guard members returned to the bar stool props, tossed their equipment in the air and nonchalantly leaned against the stools as if to say, "No big deal." Ultimately, this production from the Madison Scouts was a prime example of something then director Scott Stewart was fond of saying, "There is no theme; Madison IS the theme." 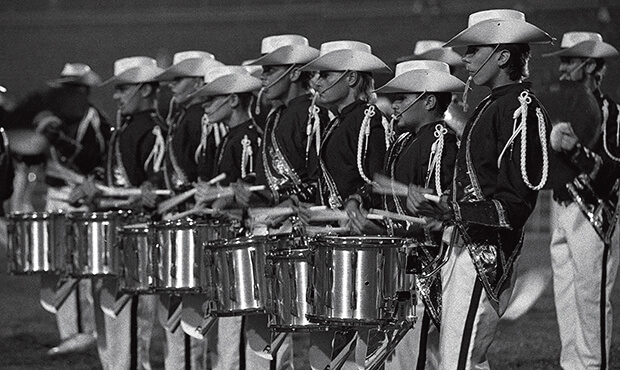 For this week only, you can save on the Legacy Collection DVD that contains this complete Madison Scouts performance, along with all finalists from the 1990 DCI World Championships. Discount DVD offer ends Monday, Nov. 10, 2014.